This missile defense capability gives the President of United States, for the first time, the strength needed to defend the country from ballistic missile threats. — Lt. Gen. (ret.) Trey Obering, former Director of the Missile Defense Agency, 2004-2008. With the American withdrawal from the Iran nuclear "deal" and the President's on-again-off-again forthcoming summit with the leader of North Korea, missile threats to the United States and its allies are very much a concern. What, then, is the status of America's missile defense programs, particularly the system of interceptor missiles and radars that now protect the American people -- irrespective of the outcomes of the summit in Singapore between the President and the head of North Korea or possible future negotiations with Iran? A frequent refrain of U.S. missile defense critics has been that America's ground-based interceptors (GBI's) in Alaska and California are so limited to be of little use in protecting against rogue state missile threats such as from North Korea and Iran. On the other hand, these same critics simultaneously claimed the U.S. missile defenses were potentially so effective against China and Russia as to dangerously undermine deterrence and international stability. Of course, U.S. missile defenses cannot be both ineffective against small threats but effective against large threats. This confusion was addressed by retired Lt. Gen. Trey Obering, the former Director of the Missile Defense Agency from 2004-2008 in a recent speech. Obering said the reason the US initially provided a "limited missile defense" is because "that was all we were able to do." Obering noted that the 1972 ABM Treaty was in effect from Reagan's 1983 SDI speech through 2002. No US missile defense system protecting the American people was legally possible. Missile defense critics accepted this, and bafflingly repeated that keeping the American people 100% vulnerable to enemy ballistic missiles was the "cornerstone to strategic stability". Just think: for a significant number of "expert analysts", giving Iran and North Korea the ability to blow us all to kingdom come was considered acceptable. In short, the thinking was that mutual vulnerability would give rise to mutual deterrence, as it is meant to do with Russia and China. Fifteen years ago, prior to the deployment of the Ground Based Interceptor (GBI), system in California and Alaska, the U.S. had no defense against long-range missiles. U.S. sea-based interceptors were also not deployed on ships because testing had not been completed. And the PAC-3 Patriot missile defenses had never been deployed operationally. In summary, said Obering, in late 2003 and early 2004, the U.S. had no missile defense except a very small number of old Patriot missiles, not even initially designed for missile defense. Again, as General Obering recalled, "There were people in this country that were very, very happy with that. They thought missile defense was destabilizing. They thought it was too technically hard to do. And they thought that it would be political Armageddon" if missile defenses were deployed. Despite the strong opposition to missile defense in the Senate, however, the Congress, along with the administration pf George W. Bush, the Missile Defense Agency, the aerospace industrial partners, and the American Combat Commanders, have been responsible for a remarkable production and deployment of missile defense capabilities beginning in the summer of 2004. "When we began to deploy these capabilities, were they perfect?" Obering continued. "No, they were not, and we knew they weren't perfect. But the critics kept saying they should not be deployed unless they were perfect." Even when the tests proved that the defenses worked, critics alleged that the tests were rigged. The important thing was to get some military utility into the hands of the war fighters and then improve the material going forward. "That's why," Obering explained, "the GBI interceptors in Alaska and California in the ground today are not the same ones the United States put out there before." In fact, using these upgraded interceptors, the United States has intercepted five of the past six targets, an 80% success rate. Now says General Obering, the U.S. has built upgraded early warning radars and new X-band radars. These new technologies are in Alaska, California, the United Kingdom, Greenland, Massachusetts, Japan, and Israel. There is, in addition, an extremely powerful sea-based X-band radar that sits in Hawaii. All help identify and track attacking missiles. The United States also has hundreds of mobile land-based interceptors and sea-based Standard Missile 3s on Aegis BMD-capable ships, including interceptors at the Aegis Ashore site in Romania, with another site coming in Poland. The THAAD (Terminal High Altitude Area Defense) system, now deployed in Korea, could not hit anything when it was first tested, according to General Obering. The United States had failure after failure. 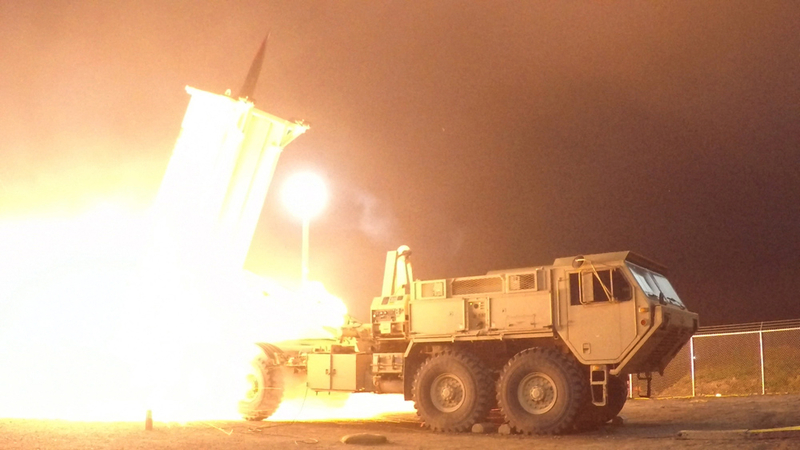 But then the U.S. figured out the missile technology; now the THAAD has the most successful test record of any ballistic missile in the U.S. inventory. Surprisingly, even when an American missile defense system had no successful test record upon which to rely, the United States was able to use it in real combat. For example, said Obering, during Operation Iraqi Freedom, despite having no certified missile defense available, when Army Major General Stan Green said he needed help, General Obering, with just a handshake, got Patriot-3 sent to the theater anyway. It was successful in three intercepts of Iraqi missiles. Now, some 14 years after the first deployment of missile defense interceptors, the United States and its allies -- particularly Israel, a number of Gulf states, Japan, and the Republic of Korea -- have deployed world-wide thousands of interceptors of all kinds. These interceptors include a GBI system in Alaska and California. The system is slated to grow from 44 to 64 and then 100 interceptors. Today, unlike the pre-2004 days, should an enemy of United States launch an ICBM at Los Angeles, the U.S. military will swing into action. A National Guard unit in Alaska will track, find and destroy whatever warhead is coming by firing the necessary GBI at the incoming missile. According to Obering, this missile defense capability gives the President of United States, for the first time, the strength needed to defend the country from ballistic missile threats. It took the United States many years to get where it is now, but the U.S. finally took that important step with an initial deployment of missile defenses in 2004. In January 2018, emergency supplemental funding was added to the defense budget to upgrade and improve the Alaska missile defense system. What worries me about this whole nuclear weapon scene is that an Islamic country can logically argue to itself that to attack their enemy, who is also an enemy of Allah is to obey Allah command to kill unbelievers, kuffars etc. That there might be moslems in the target cities does not matter because they will be in Paradise when the bomb explodes. The logical viability of that argument is frightening. All it takes is a bomb in a shipping container.